– for intense sequences of action/adventure violence, some frightening images, sensuality, and innuendo. It’s been four years since we last heard from Captain Jack Sparrow, and his last adventure with Will Turner and Elizabeth Swan left most moviegoers feeling a bit underwhelmed. Arguably, it had seemed as though the heart of the series had gotten lost to spectacle. Over the past four years, the trilogy has still proven watchable and the thought of another outting has always been welcomed. 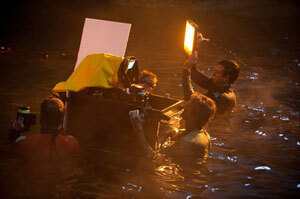 For the fourth go-around, director Gore Verbinski stepped down to let another director take the reigns. With Will and Elizabeth firmly out of the picture, we’re given a Pirates of the Caribbean film that focuses primarily on what has become one of film fans’ most beloved big screen characters (and most certainly our most beloved pirate), Captain Jack Sparrow. Acclaimed director Rob Marshall takes over for Verbinski to helm a new addition to this lucrative franchise. Marshall has mostly musicals and dramas to his directing credit, including Chicago, Nine and Memoirs of a Geisha. Pirates of the Caribbean: On Stranger Tides is Marshall’s first experience with a big action/adventure blockbuster film and he actually does a pretty fine job at creating a fourth Pirates film that feels part of the trilogy that preceeds it. It doesn’t hurt that Ted Elliott, who penned the first three films, returns to help once again with the story. There’s strong continuity for On Stranger Tides, not trying too hard to distance itself from that set of films, even going so far as to feature the map that Jack swipes from Barbossa at the end of At World’s End. It’s also great to see Kevin McNally back as Mr. Gibbs – even if he’s not given much screentime – and even some of the British officers who were background in the other films (the first and third ones) return alongside Barbossa. This all helps keep the film feeling like it’s just a continuation instead of a reboot or diversion from the already established storyline. Marshall does a fair job continuing the quest and making it fun once again. While the last two sequels seemed to get more fantastical as they progressed, On Stranger Tides only dips into that fantasy world minimally (well, in comparison). There are still more than just a few magical fairytale traits that occur in Stranger Tides, but it never quite goes so far over the top as Davy Jones’ Locker (the crabs??) in At World’s End, or Calypso’s bizarre unleashing of her fury or any number of effects-heavy craziness that was also in that film. Stranger Tides does borrow from the embellishment of the magical aspects of the sequels, but grounds it a bit more effectively by not relying so unbelievably on CGI to create otherworldly characters and scenery. Stranger Tides sort of returns things back to the basics a little, while expanding on the world that’s been investigated in the movies that came before it. 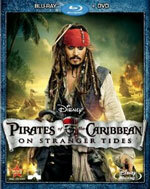 Many are saying that On Stranger Tides is very much a retread or even boring, and I have to mostly disagree. I did find a moment or two when swordfighting duels broke out where my mind began to wander as I kind of felt like I’d already seen this (like duels that duplicate the feel of Jack’s meeting with Will Turner in the first film). However, it’s the quest to fid the Fountain of Youth and Jack being Jack that make On Stranger Tides as much fun as it is. It’s a film for the fans and it’s difficult to see it any other way. There are plenty of moments and incidents that are fresh and new to the franchise, while there will definitely still be some moments or setups or even scenery where you might feel like it’s just ever so slightly reminiscent of something from the other movies (perhaps the setting of the final showdown in Tides kind of resembles the finish in the first film, but only remotely). Also, without the Will/Elizabeth love story, Tides sets Sparrow as the absolute main character and it works very well. The secondary characters get as much screen time as secondary’s should, but some of the new characters that we’re meant to care about don’t really get the necessary development they’re needed for us to truly care about them. One such new character is a missionary named Philip. When we first meet him, he’s strapped to a mast on Blackbeard’s ship and we soon learn that this young man has devout faith in God and His salvation. It’s surreal to hear the pirate Jack Sparrow talk about faith with Philip, and even the film’s truly evil villain, Blackbeard, ends up speaking on the topic. Philip is an intriguing character who seems to have his faith rocked maybe too much by film’s end, but it’s refreshing to even find a character like Philip in such a movie as this one… and him not turn out to be a jerk or villain of some kind. The faith element wasn’t taken quite as far as I would have liked to have seen, but it still was a surprising plot element to Tides. Pirates Of The Caribbean: On Stranger Tides is far from being the best installment in the franchise but the movie delivers what fans have come to expect from a Pirates Of The Caribbean movie. It’s pure escapism and fantasy/adventure with an aim at having fun, and as such it delivers. Maybe it is “more of the same” to some, but many would also complain that it’s much too different if it were done any other way. There’s enough globe-trotting, treasure-hunting, and expedition done in Stranger Tides to keep this film fun and exciting throughout. 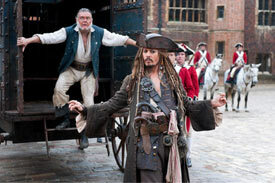 The important part is that Captain Jack Sparrow is back and has been promoted to the film’s lead — and it works. There’s also a couple-second-long post-credits scene at the end of the movie (just like the first three films) that only teases that the story isn’t over, but if you miss it, you really won’t be missing all that much. In the end, Pirates Of The Caribbean: On Stranger Tides is a fun and entertaining chapter in the series and will be one worth revisiting again and again. On Stranger Tides was actually filmed with 3D cameras, so separate 3D and 2D Blu-Ray combo packs are available for this release. I did see the film on 3D IMAX and found it to be a fun watch, but not particularly stunning when it came to how it looked in 3D (but I find the gimmick overrated anyway). However, the 2D Blu-Ray disc truly looks fantastic. It’s crystal clear and vibrant in color; it’s one of the best Blu-Rays I’ve seen in recent memory. The 2D Blu-Ray combo pack comes with a DVD, but unfortunately no digital copy (the 3D combo pack has it though). Also, the extras are shockingly slim. 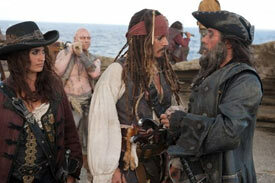 Bloopers of the Caribbean – Keeping with tradition, this Pirates film includes a short blooper reel. This time, most of them are line flubs or the cast making random faces at the camera. The most common mistake during filming that’s shown here seems to be when the crew is interacting with their pirate hats. It’s not an especially amusing blooper reel, but it’s fun to have included here anyway. It’s obvious they had fun making the movie. LEGO of the Caribbean – The LEGO building block brand has been expanding into popular film franchise licenses over the years and Pirates of the Caribbean is one of the latest to join the ranks that includes Star Wars, Toy Story, and Indiana Jones. “LEGO of the Caribbean” is a collection of five CG-animated cartoons that are variations of key scenes from On Stranger Tides. These were most likely created as promos for the toys and/or video game. They’re worth a watch for younger viewers, but they’re not the funniest or most clever LEGO spoofs I’ve seen (the Star Wars ones were some of the best). Disney Second Screen – If you have an iPad or a Macbook, you can uses “Disney Second Screen” to interact with content that goes beyond the film. Unfortunately, you need a “Second Screen” app from the iTunes app store that is specific to each film that utilizes it. At the time that this was being reviewed, the On Stranger Tides app wasn’t released yet, so unfortunately we couldn’t check it out for you. 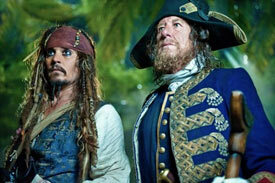 Audio Commentary with Director Rob Marshall and Executive Producer John DeLuca – The only other bonus feature is a feature-length audio commentary with the director and executive producer of On Stranger Tides. Considering that there isn’t much else on these discs, the commentary is the closest you’ll get to getting more insight on the making of the film. Marshall and DeLuca talk here most about casting, production design, set design, and on-location filming. I was surprised to hear how much of the film was actually shot on-location or on a real ship at sea, and not on a sound stage or surrounded by blue screen. Some of the jungle sets that I’d convinced myself were fake, were actually as real as it gets. I had a bit more appreciation for the film after listening to the commentary. Overall, I found the special features to be very disappointing. The previous Pirates installments had 2 Blu-Ray discs each with one disc dedicated solely to bonus material – from interactive games (which were the least interesting) to in-depth on-set behind-the-scenes featurettes. Sadly, if you want extras like these, you’ll have to pick up the 5-disc 3D set which includes the featurettes and deleted scenes. It seems unfair to force fans to buy a 3D version even if they don’t have a 3D TV or player, just to get the bonus disc (and digital copy). Oh well, hopefully this won’t become a habit, Disney. it wasn’t a sack of wine bottles, it was the entire prized collection of blackbeards bottled ships. Oh wow, really? Dang… I’ve seen it three times now and still never noticed that. 🙂 Thanks!